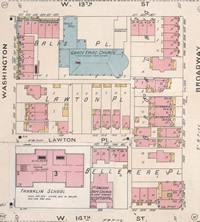 The collection of Kansas City Sanborn Fire Insurance maps in the Missouri Valley Special Collections y consists of over 1200 individual pages. The large-scale maps provide an invaluable resource for historians, genealogists, geographers, students, environmentalists, and others researching buildings, neighborhoods, and the people who lived and worked in them. Details on the maps include building footprints and numbers (addresses), street names and elevations, construction material, number of stories, and features like hydrants, fire alarms, and water mains. The locations of underground gasoline or oil tanks and water pipes are also indicated. The maps show rivers, railroad tracks, bridges, and types of buildings, like greenhouses, theaters, stables, etc. They identify businesses, schools, churches, hospitals, and other buildings by name. The Missouri Valley Special Collections has 19 bound volumes of Kansas City Sanborn maps, which have been digitized, and some Kansas City volumes and selected Missouri cities on microfilm. Please note that Volume 9 (both 1930-1941 & 1930-1957) may only be accessed at the Kansas City Public Library. All others are available anywhere in the world at www.kchistory.org.